The controversial method for mining natural gas known as fracking might trigger asthma flare-ups, according to a US study. Pennsylvania doctors found patients' asthma was harder to control if they lived near a fracking site, compared with other asthma patients. The findings, in more than 25,000 patients, are not proof of a causal effect. The authors say in the journal JAMA that more safety studies are needed. Fracking, or hydraulic fracturing, involves drilling down miles underground and blasting the shale rock with a high-pressure water mixture to release the natural gas trapped inside. Proponents say it has the potential to be greener, in terms of carbon footprint, than some other energy sources. Critics are worried about the impact on humans and the planet - namely, air and water pollution, earth tremors and potential health risks. Public Health England has looked at the issue in the UK and believes "the risks to public health from exposure to emissions from shale gas extraction are low if operations are properly run and regulated". The US has already pushed ahead with fracking, which is now a big industry. 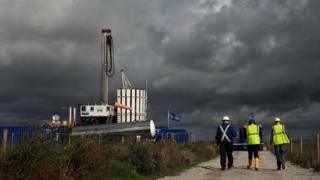 The UK, however, has remained cautious and paused its pursuit following a couple of small earthquakes near a test drilling site in the Blackpool area. US researchers, funded by the National Institutes of Health, set out to study the impact of fracking on the population of Pennsylvania - a region which has seen more than 6,000 shale gas wells drilled in the last decade or more. Using local electronic health records, they identified asthma patients and checked if fracking activity might be linked to disease flare-ups over a six-year period. A flare-up was defined as mild if the patient needed to be prescribed a steroid inhaler, moderate if they needed to go to the emergency department and severe if they had to be hospitalised for their asthma. The Johns Hopkins researchers looked at the distance the patient lived from an active fracking site, as well as other risk factors, such as whether they lived by a busy road. Patients with asthma in areas with the highest fracking activity - judged on distance, size and activity of the shale gas sites in the locality - had higher risk of asthma flare-ups compared with asthma patients living in places with low fracking activity. The odds of a flare-up was about 1.5 to 4 times higher, but the researchers still do not know why. They believe air pollution from the shale site itself as well as the heavy vehicles needed to build and service these facilities might be to blame, although they don't have any proof. Researcher Sara Rasmussen said: "We need more studies now to explore this theory. Another possible pathway is stress." Asthma can be exacerbated by stress and she says people living in the communities they studied would have had to deal with disruption as the shale gas sites were built. But, again, it's not clear if this would have an impact. Dan Murphy of Asthma UK said: "Asthma is a complex condition affecting one in 11 people in the UK, yet years of research underfunding means it still remains a relative mystery. "While this study suggests that living near fracking industry wells may increase risk of an asthma attack, more research is needed to get a clearer picture of the connection between the two and the impact on people with asthma." "The study - and many others like it - actually doesn't have any evidence to prove causation, while numerous studies that actually provide real evidence that fracking is reducing asthma throughout the US continue to be overlooked." Update 20 July 2016: This story has been updated to include a response from the fracking industry.